NDNU is a Catholic, not-for-profit, coeducational institution serving approximately 1,600 students. Established in 1851 by the Sisters of Notre Dame de Namur, NDNU is the third-oldest college in California. The University is fully accredited and offers a rich variety of undergraduate, graduate, doctorate, and teacher credential programs, many designed for working adults to complete their degrees in the evenings. The historic campus is located on the San Francisco Peninsula in Silicon Valley, with easy access to freeways and public transportation. 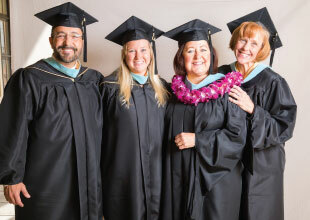 As a master’s university dedicated to higher learning, NDNU is proud to deliver good value, innovative faculty, mentorship, extensive professional networks, and a diverse population. Of our full-time faculty, most hold doctorates or terminal degrees. All programs are carefully designed to meet real-world criteria for application and marketability. The average class size is 17 students, and individual attention helps students actively learn and collaborate. An emphasis on practical application gives you an immediate advantage in your field. Most of the graduate courses are offered part time in the evening year-round (spring, summer, and fall), and some are offered in a hybrid format to give you more flexibility as you balance your personal and professional life with classes. Recent expansion includes programs completely online as well as new graduate and credential programs offered in Tracy, California. Join a community of influential professionals and gain access to a networkof working faculty, students, and graduates. NDNU has formal partnerships with leading San Francisco Bay Area corporations, regional school districts, and human services agencies. Networking events are frequently organized.